Dark Chocolate Hollow Egg with Rock Salt. 60% cocoa. A thick chocolate shell with pink Himalayan salt. Seriously good chocolate. Fairtrade cocoa grown by family farmers in Ghana. Natural ingredients. 100% pure cocoa butter. No palm oil or soya. No artificial flavours. Vegan. 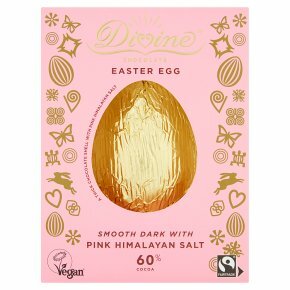 Deliciously rich smooth dark chocolate infused with a dash of pink Himalayan salt in a thick chocolate shell Discover the full range of delicious Divine Easter eggs, from smooth milk chocolate mini eggs, to nutty pralines, to our top selling flavours in smooth chocolate shells. All of our eggs are Fairtrade, made from natural ingredients and with no artificial flavours.